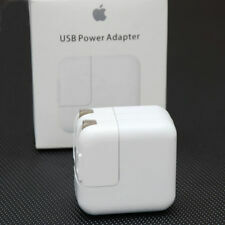 Apple AC to USB Power 10W for Apple iPad, iPhone, iPod Genuine Apple item NO RETAIL PACKAGING Free shipping. Trending at $6.46eBay determines this price through a machine learned model of the product's sale prices within the last 90 days. Apple iPhone Models iPhone 5, iPhone 5c, iPhone 5s, iPhone SE, iPhone 6, iPhone 6 Plus, iPhone 6s, iPhone 6s Plus, iPhone 7, iPhone 7 Plus, iPhone 8. iPhone 8 Plus, iPhone X, iPhone XR, iPhone XS. 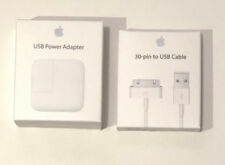 Included is 1 x 12 Watt usb adapter. Condition is New loose still had plastic wrap around it. Save up to 20% off when you buy more! Fast shipping! Power = 12W. Cable,for iPhone 5/5C/SE/6/6S/6 6S Plus/7/7 Plus,iPad mini,iPad Air etc. we will reply it ASAP and solve it for you as we can. Output: 5.2V == 2.4A. 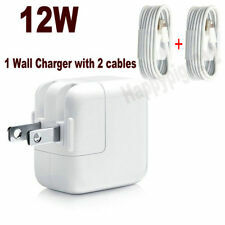 Genuine 12w USB Power Adapter . · Apple ipad. · Apple ipod. · Apple iphone. IPad Series. Output: 5.2V 2.4A. Color: White. 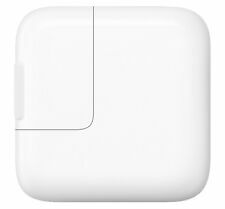 Apple 12W USB Power Adapter for iPads MD836LL/A. 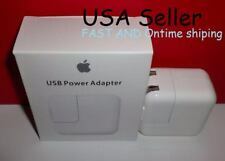 (1) Apple 12W USB Power Adapter for iPads MD836LL/A. Item Condition. This information is available at checkout. 1- Lightning Cable 1M. No exceptions. : :Condition notes: Condition of each item may vary. May have scratches/marks/signs of use. Unit was tested and works perfectly. Color: White. I will work with you till you are satisfied. Product Features. Mac Models. iPad Models. iPhone Models.